Chapters: 1. Intelligence: History of the Concept. 2. What is Intelligence? 3. Tests and What They Measure. 4. Regression Toward the Mean - a Mysterious Force of Nature? 5. Entry of the Theories. 6. The Hereditarian Viewpoint. 7. Interaction. 8. Milieu and Compensation Programs. 9. Education, Equality and Talent Reserves. References. 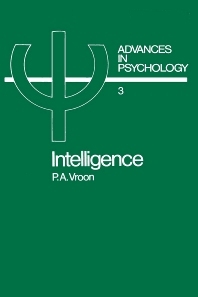 Presenting a philosophical and psychological overview of the history of the concept of intelligence, this controversial text does not aim to supply yet another opinion on, or interpretation of the concept of intelligence, but rather attempts to find out how to approach this concept on a scientific level.